Ad viewability is important to every business because it’s one of the many indicators measuring the effectiveness of each campaign we have launched to targets. Recently, Google released “The state of ad viewability” report showing what are the significant factors influencing the performance of Display Ads and Video Ads on Google’s platform. Some things you need to think about carefully before launching any OHM campaign: location, visibility and traffic. You need to do the same with an online campaign. 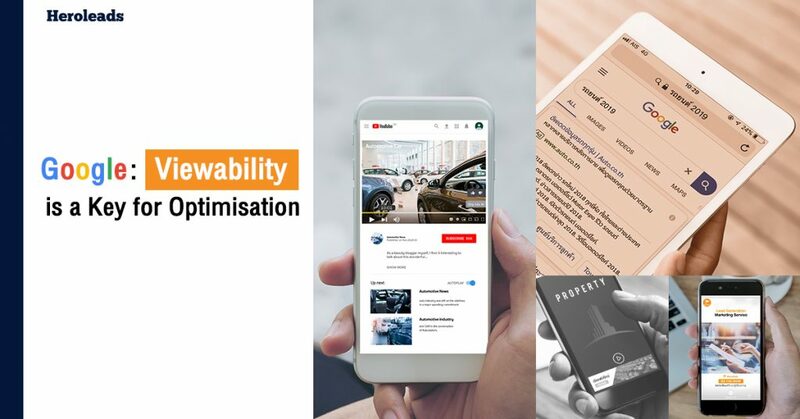 Here, we’re going to explain more about what Ad viewability is and how can it improve ad performance. Did you know that device affects the campaign’s performance? Google shows that users will experience significantly higher viewability for video and display ads on mobile and tablet than on desktop. When it comes to video ads on YouTube, Website, Application or those platforms which partner with Google, findings reports that large video players have significantly higher viewability.However, vertical videos have above average viewability as well. Above-the-fold videos definitely have a higher viewable rate but below-the-fold ads are still viewable as well. Based on Google, 45% of video ads below the fold are viewable and it’s likely available for lower CPMs. So, this is another good alternative for online marketers. To summarise, there are many factors that marketers need to take care of before creating any campaign. So, Heroleads’ dedicated teams are working tirelessly to discover the best solutions to make the most of your investment and make the most valuable choices for our clients.